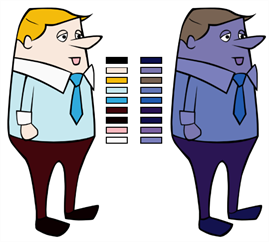 A character usually has only one master palette, although there are times when the characters are placed in different lighting conditions and require a different colour shading. The night palette is a popular choice when a scene or sequence changes from day to night. It can be difficult and time-consuming to repaint everything and creating two independent palettes can be quite complex. As an alternative, Toon Boom Harmony provides clone palettes. The clone palette is a copy of the master palette. The colours in each palette have the same properties. The colours have the same identification number pointing to the same colour zones, but they can have different names and RGBA values. Depending on the palette (night or day) you're currently using, the painted drawing will update. So there's no need to repaint the animation. All you have to do is create or import a clone palette (palette style). In the Colour view, select a palette to clone. 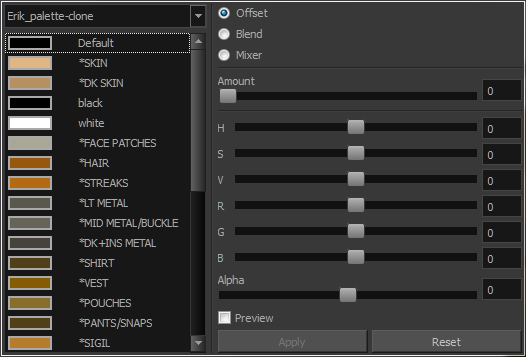 From the Colour menu, select Palettes > Clone or right-click and select Clone. The Palette Browser: Clone Palette dialog box opens. If you're in Advanced Palette List mode, select the palette storage level—see About Palettes. 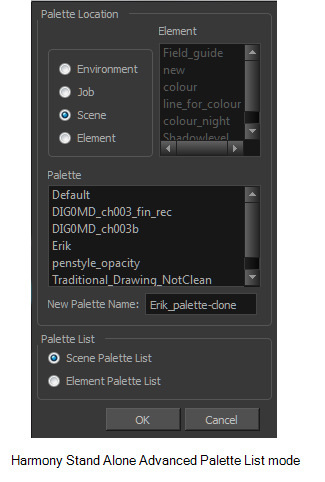 In the New Palette Name field, name the palette. We recommend keeping the "-clone" in the name. 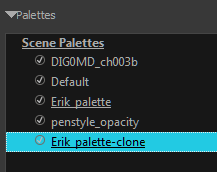 The cloned palette appears in the palette list. 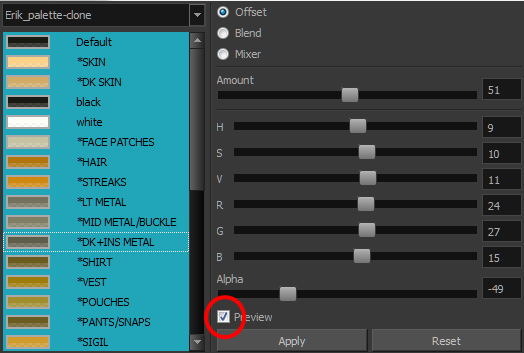 In the Palette list, select the clone palette you created to offset or blend colours—see Mixing Colours. From the Colour View menu, select Palettes > Tint Panel or right-click and select Tint Panel. The Blend/Offset Tint panel opens. Select one or more colours to modify. You can select all your colours by pressing Ctrl + A (Windows/Linux) or ⌘ + A (Mac OS X). Offset, blend, or mix the colours using the sliders and increasing the Amount value. Select the Preview option to see a preview of the colours while you adjust them. NOTE: You can also modify the colours individually with the Colour Picker window.